Everything you need to know about notability has been put together for you in this easy to read guide to Wikipedia notability. One of the queries I receive on a daily basis deals with what qualifies someone for a Wikipedia page. Well, it comes down to notability. Notability is the criteria used by Wikipedia to determine if a topic should be included in the world’s largest encyclopedia. After all, without this requirement, everyone would have a Wikipedia article. As a disclaimer, I must tell you that I don’t work for, nor am I affiliated with, the Wikimedia Foundation. This is the non-profit group that runs Wikipedia and its sister sites. So, what makes something notable? The statement above is all you need to remember. Once you understand what each term means in regards to Wikipedia, you will easily be able to tell if a topic is notable enough. I put this guide together as notability is commonly misunderstood, both by newbie and experienced editors. Wikipedia’s guidelines on notability are long and difficult to understand. This guide breaks things down into easily understood terms that anyone can understand. After all, you just want to create a Wikipedia article, not create a flux capacitor (yes, I aged myself with the Back to the Future reference). However, if you are a bookworm and like to read volumes of rules and guidelines, I have included all Wikipedia guidelines on notability at the end of this guide. Feel free to read them, study them, burn them, or whatever. Let’s assume we are checking for in-depth coverage of the company “The Honest Kitchen,” an organic dog food supplier. There are plenty of references out there which means it has received significant coverage, but which ones can actually be used for notability (as they cover the company “in-depth”)? There are two articles that I looked at to demonstrate Wikipedia’s definition of in-depth. The first is a June 15, 2015, article in the Daily Herald. 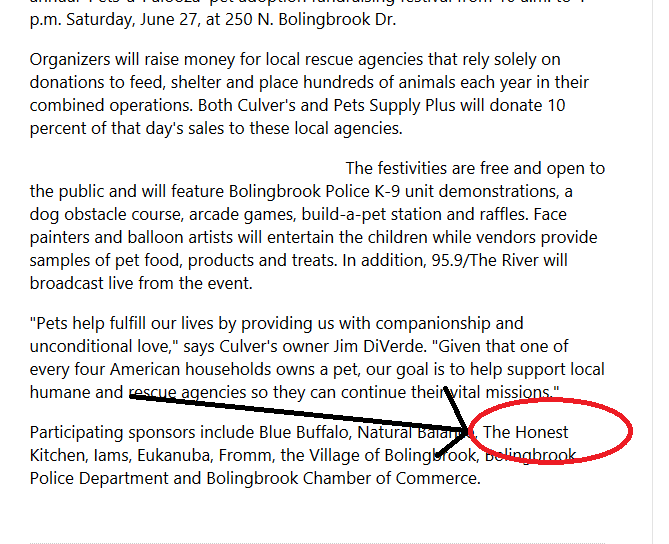 The article name is “Culver’s, Pet Supplies Plus host 4th ‘Pets-a-Palooza’ fundraiser, adoption event.” If you look at the image from the article below, you will see that The Honest Kitchen is talked about; however, it is only a mention of their participation. This is referred to as a “brief mention.” While it can be used as a reference to show they participated in the event, it cannot be taken into account for notability. If all the sources you find on The Honest Kitchen are brief mentions such as the above, this will not meet the definition of “significant coverage” as there is nothing that talks about the company in-depth. This article is from Forbes. 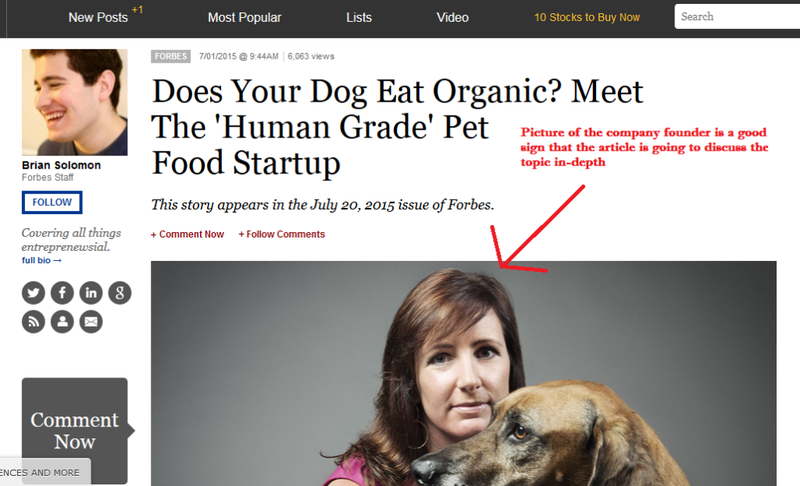 The article title is “Does Your Dog Eat Organic? Meet The ‘Human Grade’ Pet Food Startup.” This article talks in depth about organic dogfood (which coincidentally is what The Honest Kitchen does. Good chance this one will talk about them). In fact, you can see below that not only does it mention them, the majority of the article is a feature about the company itself. It details who they are, what they do, and lays out some of the company’s history. This is the type of article that shows notability. Now, there is no set number of articles needed to show notability. As such, I would advise finding as many as you can. Obviously, the more articles you have that talk about the topic in-depth, the more you can show that the topic is notable. Reliable Sources are something that is debated on a daily basis by Wikipedians. Basically, a source is considered reliable if it is a published source that is trusted. This means that the publication must have editorial control over its content (e.g., fact checkers) and it must be known as being reliable. Topics can also dictate what is considered reliable. For instance, medical articles generally do not allow for references from anything other than peer reviewed medical journals. This means that although The New York Times may talk about a new breakthrough medical treatment, the Wikipedia article about the treatment will generally only use published studies on the treatment, not The New York Times Article. If you have a question about a source and whether it is reliable, there is a noticeboard where you can go and pose the questions. Simply follow this link, create a new topic, and ask if a specific link is reliable. You will receive numerous responses from editors who patrol that page on a regular basis. There is a general checklist that Wikipedia has put together to help you determine if a source is reliable. So, familiarize yourself with the sources generally used in Wikipedia, use the checklist here, and consult the notice board with any questions about a specific source that you located. Being “independent” is difficult to understand, especially for those new to Wikipedia. However, it is at the core of Wikipedia and must be followed in order to maintain its integrity. Simply put, a self-published source is not to be used for notability. There are many times when a self-published source can be used (such as using a company website to the source where the headquarters are located), but never for purpose of notability. If you want to establish notability with a press release, you are barking up the wrong tree. The article you create will be quickly deleted as the press release is not considered independent of the topic. Here is why it is difficult for newbies to understand. They see self-published sources used all the time in Wikipedia which gives a false perception that they are acceptable. In fact, self-published sources ARE acceptable in Wikipedia, but not for establishing notability. So, you will find social media profiles, press releases, and company websites cited everywhere on Wikipedia, but if they are being used for notability purposes, chances are the topic isn’t notable enough for Wikipedia and is likely to be deleted. Now, what about interviews in major newspapers? Many people think that these are acceptable since they are in a major publication. Unfortunately, they would be wrong. While the source itself may be considered significant and in-depth, the fact that the wording is the statement of the subject being interviewed, it would be considered a self-published source. Now that you understand the “general notability guidelines,” we need to go through the various notability guidelines specific to each topic. Thought we were done, didn’t you? These additional guidelines are set up to help editors choose which topics are notable for specific fields. For instance, a different set of notability guidelines applies to “schools” then do “musicians.” In fact, most schools that are equivalent to high school or above are considered defacto notable as long as you can find a reference to prove it exists. This is a large contrast to guidelines for biographies, which are the most stringent notability guidelines on Wikipedia. Salamuddin Shaikh is a co-founder of Wikipedia Experts, first comprehensive Wikipedia service for businesses, offering article writing, monitoring, and repair services, fulfilling an increasing demand for professional Wikipedia guidance. His visionary leadership and flamboyant management style have yield fruitful results for the company. He believes in sharing his strong knowledge base with leaned concentration on entrepreneurship and business. Previous Post How To Get A Wikipedia Page And Get It Stick Next Post How to Create a Wikipedia Page for Your Brand, Company or yourself?